The state is requesting a permanent injunction and civil penalties. Four La Porte residents have also sued Intercontinental Terminals Company. The fire at the ITC Deer Park petrochemical storage facility reignited on Friday March 22, 2019, around 3:40 p.m. and then was extinguished. Updated on Friday March 22, 2019, at 5:55 p.m. 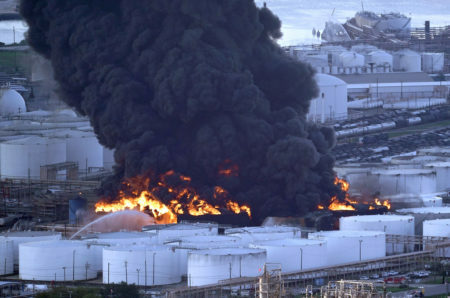 The State of Texas is suing Intercontinental Terminals Company (ITC) for violations of the Texas Clean Air Act related to the massive fire at the company’s Deer Park petrochemical facility and its aftermath. Texas Attorney General Ken Paxton filed a petition for injunctive relief on Friday in a Travis County district court. Texas has requested that the court grants a permanent injunction and civil penalties. Toby Baker, executive director of the Texas Commission on Environmental Quality (TCEQ), said in a news release that only air quality violations have been cited in the lawsuit due to the ongoing investigation. Baker added that “any additional violations, including surface water quality” will be referred to the Attorney General. Additionally, four La Porte residents have sued ITC. They are seeking punitive damages of more than $2 million. 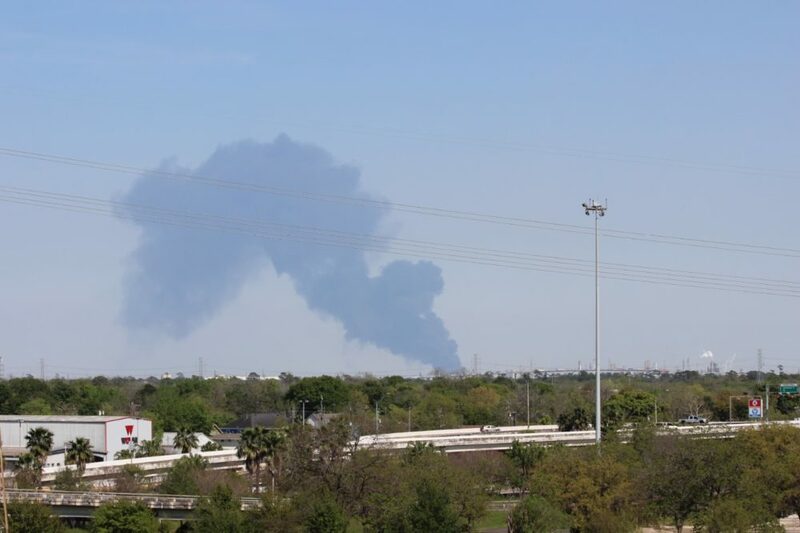 The fire reignited around 3:40 p.m. on tanks located in the west side of the facility but it was extinguished, according to Harris County Deputy Emergency Management Coordinator Francisco Sanchez. The Beltway 8 Ship Channel Bridge was temporarily shut down. 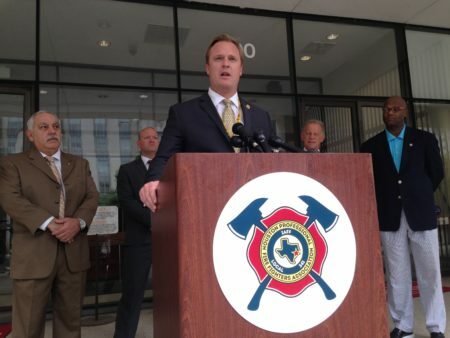 The Harris County Fire Marshal’s Office is leading the investigation into the origin and cause of the fire. They have contacted the Houston area representative for the Bureau of Alcohol, Tobacco, Firearms and Explosives (ATF) to assist in evaluating the scene as soon as it’s safe to enter. The Houston Independent School District canceled all on-campus weekend activities for schools located in the eastern part of the district. Sporting events at those campuses are being rescheduled at alternate locations. Earlier on Friday, one of the containment walls of the tank farm, which sustained a three-day massive fire, partially collapsed around 12:15 p.m. on Friday. The wall is located on the north side near Tank 80-7. ITC said in a statement it advised its industrial neighbors and the Battleship Texas and Monument State Park to consider taking shelter in place precautions. Deer Park Mayor Jerry Mouton told News 88.7 the city hasn’t recorded any readings of toxic materials in the air after the collapse. Galena Park Mayor Esmeralda Moya also reported via Twitter their air monitoring wasn’t showing volatile organic compounds or benzene as of 2 p.m.
ITC said it’s working with federal, state and local officials to resolve the situation caused by the collapse of the containment wall. Sierra Club, along with other local groups such as Air Alliance Houston and Houston Climate Movement, have organized three town hall meetings to analyze the incident and its repercussions to local communities. The first one is scheduled for Friday at 6:30 p.m. in Pasadena. The other two will be held at Rice University on Saturday, starting at 2 p.m., and at Talento Bilingüe de Houston on Sunday, starting at 2 p.m. 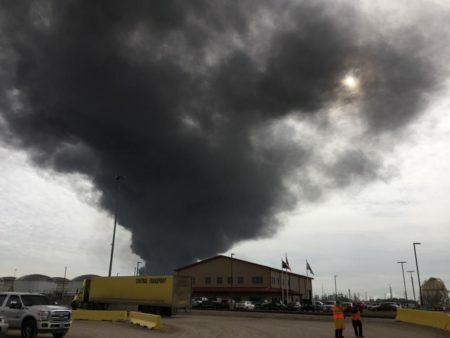 Earlier on Friday, the Environmental Protection Agency (EPA) said the situation in Deer Park and its vicinity was becoming stable after a three-day massive fire at the petrochemical facility. No benzene emissions have been recorded since 12 a.m., but the company that owns the facility warned there could be emissions throughout the day due to the cleanup of the tanks. EPA representative Adam Adams said at a 10 a.m. news conference that the three benzene readings the agency recorded happened on Thursday. “Outside of that, there’s been no detections at all for benzene or volatile organic compounds above 1 part per million,” he said. The EPA is using its Trace Atmospheric Gas Analyzer (TAGA) bus to monitor the air quality. About 250 locations have been monitored. The agency’s Airborne Spectral Photometric Environmental Collection Technology (ASPECT) plane is also providing air monitoring flights over the area. The EPA is also sampling the water and Adams said he hopes to get a first set of results by the end of Friday. Weber acknowledged there is a possibility of vapors being released during the pumping, because a layer of foam on top of the chemicals could be moved around. The foam helps to suppress the vapors, including the benzene, and Weber said there is an elevated risk of benzene emissions during the cleanup process. Several KIPP campuses, as well as San Jacinto College and Lee College, also canceled classes. The Texas Commission on Environmental Quality is also monitoring air quality, in addition to Harris County. The agency has a website with updated information. ITC also has created a section on its website with updated information. The U.S. Chemical Safety Board will investigate the fire. The agency said in a statement that investigators will start interviews next week and plan to be on site for several days to document the scene and collect evidence.